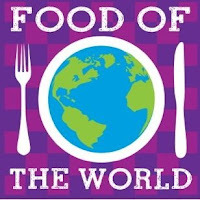 Food of the World brought us to Malaysia this month, such a strange and wonderful cuisine. Because Malaysia borders Singapore and Indonesia it's food is really a mixture of all of the South Asian cuisines. I found this Mee Rebus soup to be very unintimidating. I've made a very simplified version that doesn't include many of the harder to find Asian ingredients. Mee Rebus soup really can be made from any type of protein: chicken, fish, beef, or tofu or any combination. You definitely can experiment with what you add to it. It is a great soup for clearing out the refrigerator. I love the flexibility of this soup. Can't wait to see what you tried from Malaysia. 1 tablespoon neutral vegetable oil: I used grape seed. 16 ounces of frozen Seafood Blend (I used Trader Joe's) You can use just shrimp too. 1) Whisk together tomato paste, star anise, ginger, green curry paste and oil. Once the seasoning is blended whisk it into the chicken stock. 2) Put chicken stock mixture in a large sauce pan on high heat. Bring to a boil. 3) Add seafood to boiling stock, stir. It will most likely stop boiling from the frozen seafood. Wait until it returns to a boil and then add noodles, stir. Boil for about 2 minutes or until the noodles soften and the seafood is opaque. 4) Add lime juice to the soup just before you are going to serve it. Put garnishes on individually. It is fun to have everything out of the table and let people sprinkle what they want into the soup. Next month we will travel to Germany for the Christmas season. Nothing says this holiday like German baked goods, especially cookies. Join us on December 10th to share a German recipe. Until then I say, "Auf Wiedersehen." That looks really good Diane. I love Malaysian flavours. Any Asian flavours really. We have a great fusion of Asian cuisines here in Australia, having a very similar climate to South East Asia. You've inspired me to try some more Malaysian cooking. And I bet you get a lot of good imports being so close to Southeast Asian. Thanks Adelina... I did forget the obvious, 6 ounces of stir-fry or egg noodles. 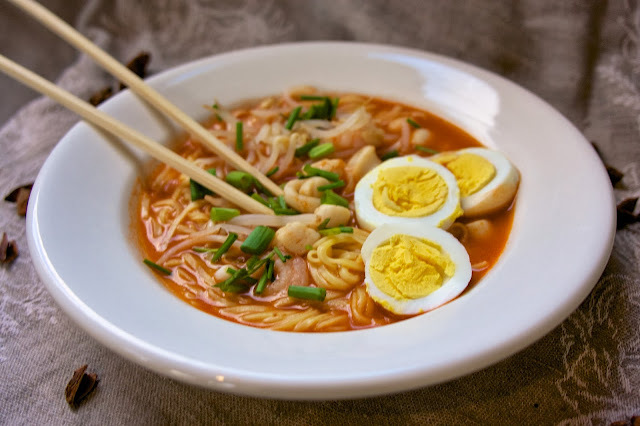 Your Malaysian Noodle Soup looks really good. I didn't make it to Malaysian with you'al this month, looks like it would have been a fun trip. Maybe I will make it to Germany for the Christmas holiday. Thanks for sharing and hope you have a great week! I hope you can make it next month... I know it is a busy time of year. Thanks for stopping by. This soup has me drooling! I love noodle soups and this one looks quite special. Interesting use of star anise. Thanks CJ I tried to get the essence of this soup but still have be a quick weeknight meal. This soup looks wonderful. I've not had anything quite like it before. Thanks for sharing it! Loved the post and the recipe. Thank you for making this seem to easy. It is a simplified version of the original recipe...and it is easy to make. I hope you give it a try. It definitely has enough of the flavor of the original recipe. 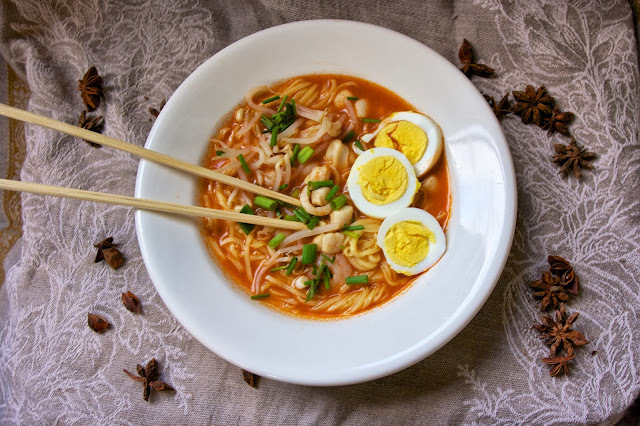 Thanks so much for sharing your great Malaysian Noodle Soup recipe with Full Plate Thursday and enjoy your Thanksgiving week!